Patients suffering from Chronic Back and/or Neck pain associated with failed surgeries and other biochemical treatments have shown to be particularly receptive to Calmare® Pain Therapy. This treatment sends 'no-pain' messages, which are transmitted to the nerves through surface electrodes and applied to the area (s) of the patient's pain. The feelings of pain are scrambled and replaced with no-pain messages, by using the same pathway through the surface electrodes in a non-invasive way as a safe option for back and/or neck pain treatment. Patient's pain, regardless of intensity, can be completely removed for immediate relief. 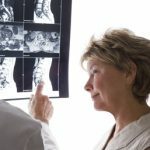 Failed Back Surgery Syndrome is a term used to describe the different types of low back pain that continues after back or spinal surgery. Even the best surgery can result in persistent pain. Currently the most common forms of treatment include physical therapy, transcutaneous electrical nerve stimulation (TENS), nerve blocks, and medications. Once the pain has lasted more than four months post surgery, the pain has most likely become chronic pain, meaning a lifetime of suffering, but doctors are now seeing positive results using the Calmare® Scrambler Therapy.